In this final episode of Youth Producers for the year, the students take us through some of their favorite projects they worked on this year and what they are looking forward to doing next year with the Youth Producers Club. Dudley Foster a retired former pilot of the ALVIN recounts some of his adventures inside the ALVIN including the discovery of the Titanic to studying plate tectonics. This meeting took place at the Falmouth Public Library on June 19, 2014. In this exclusive we highlight the Cancer Poetry contest this summer at the Falmouth Public Library. Adrienne Latimer from the Cancer Resource Center at the library walks us through the submission requirements and deadline. The winners will be announced and the poems will be read on August 23rd at the Falmouth Public Library at 10am. Dr. Mike Fishbein leads a cancer awareness discussion with panelists Dr. Dan Canaday-Radiation Therapist, Dr. Keith Bleiler-Urologist, and Dr. Peter Hopewood-General Surgeon. Support FCTV while shopping for Dad! Now through midnight on June 15th, anytime make a purchase through the AmazonSmile program, Amazon will donate $5 to FCTV. Click here for more info and thank you for your support! Interview with the author, Troy Clarkson, at the Book Launch Party for Succanesset Snapshot on May 22nd. Produced by FCTV. Shot and Edited by Tony Sadera. Interviews and coverage from Crooked Coast's Video Release Extravaganza event that happened May 28th at the Falmouth Cinema Pub. Produced by FCTV. Shot and edited by Basia Goszczynska. FCTV's four new GoPros have arrived! Super compact, lightweight and equipped with a waterproof case, the possibilities of what you can shoot with these cameras are endless. Call us today to schedule your one-on-one, hour-long training to get authorized to check these out for use in your next production. More... about FCTV's GoPros have arrived! The July 2014 'FCTV Presents' is Online NOW! 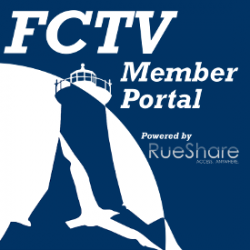 The July 'FCTV Presents' is now available HERE! More... about The July 2014 'FCTV Presents' is Online NOW!